As a business based in the UK in January 2019, uncertainty about the market environment is our current status quo. It is therefore always helpful to be able to look externally and see what is happening outside of the UK 'politosphere' and see that there is some optimism and some certainty. The IBO 2019 Industry Forecast has just been released, and is a great read for all of us who work in and service the global life science and analytical instrument industry. The good news is that IBO has crunched all its numbers and predicts a continued overall growth of 5% across the industry in 2019. This is expected to be better than each of the three years 2015-2017. The big performances continue to come from expected segments such as life science, which accounts for 25% of the analytical instrument and lab products industry. Biotech is identified as the area predicted to have the fastest growth in demand for instrumentation in 2019. IBO identifies thirteen technology segments that supply this market segment, and of these, the standout above average performance is expected from microarrays and sequencing. Conversely, below average performance is forecast from both SPR/ label-free detection and also from nucleic acid prep and cell separation. One note of caution that IBO identifies is that the slowdown due to the trade difficulties between the US and China will have an impact on the market overall in 2019. 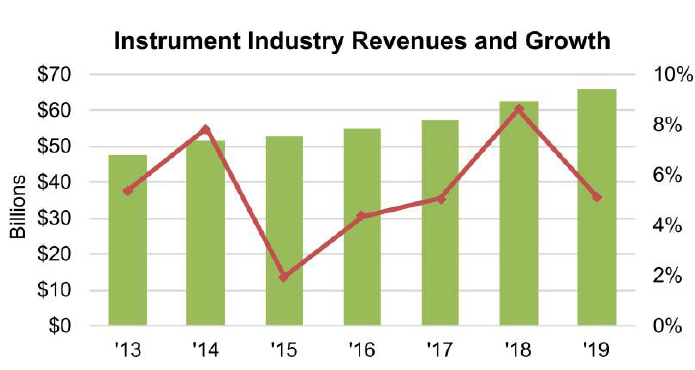 The 2019 Forecast report from IBO provides a detailed overview of 2019 projections for all key instrument market segments and is a must-read for anyone involved in the industry. Here is our top line summary of key opportunities by segment. Mass spec is predicted to have strong and steady growth from 2018 through 2020. 2019 is expected to see above market average sales for this technology, buoyed by robust demand from pharma, biotech, food testing and environmental. The only product line that sees decline is magnetic sector MS.
IBO provides an interesting breakdown of the competitive landscape for MS in the forecast. Chromatography is also forecast to perform healthily in 2019, after a strong year in 2018. IBO particularly attributes the sales boost from the continuing legalisation of cannabis as contributing to this growth. This helps to fuel the continued demand for HPLC and GC. Clinical HPLC is identified to be the standout performer of 2019. The lab automation market is forecast to see more modest growth than mass spec and chromatography, after a strong 2018. Demand is predicted to come predominantly from pharma, biotech and CROs. The informatics, robotics and microplate reader sub-technologies are expected to under-perform the lab instruments industry as a whole. The microscopy segment will see robust performance in 2019. Confocal microscopy is the stellar technology, and electron microscopy will also see healthy growth, partly attributable to demand from life science imaging and the microelectronics and semiconductor industry. 2019 is expected to see demand but it will be less strong than 2018. Demand is expected to come from the pharma, semicon and electronics industries. ICP-MS is expected to be the best performer in the segment. Strong performance of the life science sector will drive demand for products from the molecular spectroscopy segment. Strong demand is forecast for IR and NIR products in government testing. The 2019 total market for materials characterisation is expected to see strong growth. The market for physical testing instruments is expected to grow robustly in 2019, buoyed by demand from the pharma, automotive and chemical industries. Among the materials characterisation technologies, the particle characterisation category is also forecast to post impressive growth, thanks to demand from the environmental testing and semiconductor industries. The total market in 2019 is forecast to under-perform against the overall market. While biotech and pharma are pushing demand, the overall market for lab equipment is expected to under-perform the overall market in 2019. Only transfection and bioreactor technologies are identified as outperforming the segment. This kind of market insight is invaluable to life science marketers. Not only is current and historical data incredibly useful in determining what share of the market you might have vs. your competitors for bench-marking, but future projections help validate your marketing plans. Putting dollar values against market growth in your segment and thus monetising the growth you are aiming for, will help you to secure resources and investment and evaluate the success of your activities throughout 2019. We work closely with clients in many of the segments outlined in the report to better communicate with their complex audiences to grow awareness, change perceptions, generate demand and ultimately, grow market share. Our business is able to support you globally with services into China, Europe and North America. To buy the full report, click here. For more information about IBO click here. For more information about IBO’s publisher, SDi, a leading business intelligence firm offering in-depth market reports, click here. To find out more about communicating with laboratory markets, contact us.